Changing an Old WordPress Blog From HTTP to HTTPS Has Problems – From Social Counts to Complex Errors. It Demands a Neat Planning. You will read lot of similar articles on Internet, but basically most are either useless or incomplete or promote their own services. We wrote the guide on Comparison of SSL Certificates Cost, which is basically the next steps after Guide for Installing WordPress on Rackspace Cloud Server (Ubuntu 14.04 PVHVM) and Installing Comodo SSL Certificate on Rackspace Cloud Server. You can get the details of Extended Validation SSL Certificate here (EV cert, Green color, costs more). EV costs a huge plus usually not wildcard (means do not cover the subdomains). Possibly you’ll use a wildcard SSL. Never ever use a Third Party Service (like CloudFlare) to deliver HTTPS pages. Still now, Google and other search engines do not say anything, but it is likely to be not honored in SERP in future as the target is not to validate the DNS or domain but the content policy of the domain. For SSL protected websites, you must not be using doubtful plugin or Plugin which is crafted by minimally doubtful person. Keep in mind – Plugins are the only way to connect outside the server protected by SSL without your permission. Create a fresh wordpress blog with SSL, which will sit at root of FTP. Possibly, the links towards HTTP url when 301 redirected towards HTTPS URL, give kind of same SEO value. But you must try to change the url on known, reachable places to HTTPS. 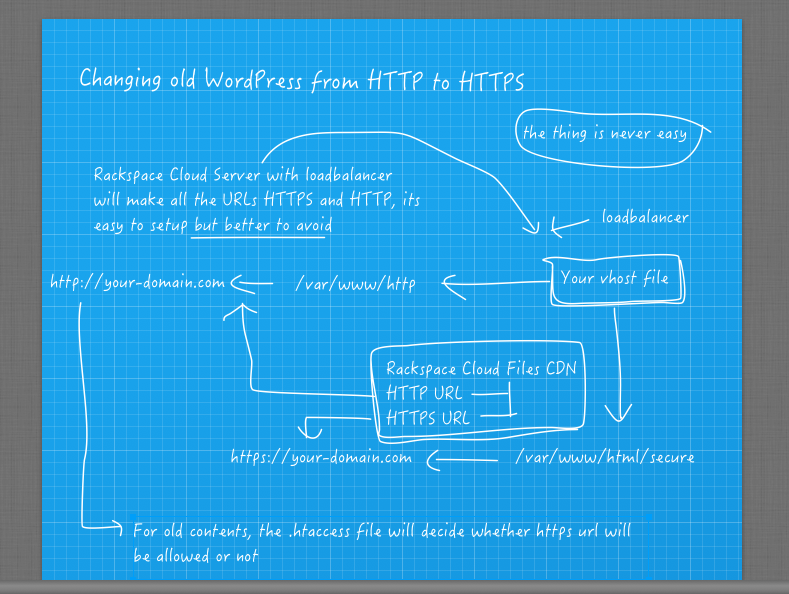 Changing Old WordPress to HTTPS From HTTP : So, How The Thing Goes Like? You will get mixed content error, to avoid the complexity; many website never uses HTTPS. Setting up HTTPS for old website is difficult, SERP is unpredictable, so two separate setups must be there to have a way to switch back. So your document root on apache virtual host will be different – easy and legit thing. Actually it fully depend how many content you have, what are the counts of social shares etc. If the counts are lower (like for old posts), you can specifically redirect the old post HTTP to HTTPS url and freshly share. This is the way maintained for professional setup. In case you switch back to HTTP only, you have to use free self signed OpenSSL certificate to avoid 404 and redirect to HTTP urls. 301 or 302 is better than 404 – quite important. This Article Has Been Shared 1866 Times! Cite this article as: Abhishek Ghosh, "Changing Old WordPress to HTTPS From HTTP : Master Guide," in The Customize Windows, June 7, 2014, April 21, 2019, https://thecustomizewindows.com/2014/06/changing-old-wordpress-to-https-from-http-master-guide/.